Random thinking during an Australian dusk. I strongly suggest you click these to enlarge them. Well, I did mean ‘serviced’ Hermes 3000, but I had the book ‘Zen and the art of Motorcycle maintenance’ in mind while I was writing this. 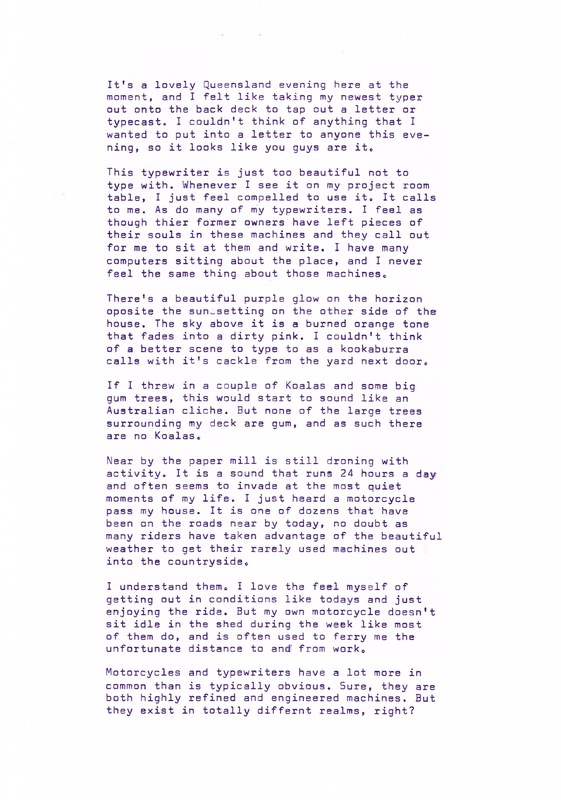 June 30, 2012 in fixed, Hermes, machines, maintenance, motorbike, motorcycle, purple ink, typecast, typewriter. ← Typecasting from Paradise City. The other one. Excellent typing job. This has got to be one of the neatest (literally) typecasts I've seen. I try hard but I always end up with a typo or two. Or three. Liquid eraser is my best friend. I didn't realize that you live down under. An accompanying pic would be nice now and then. p.s. Pic of your environs, I mean. There's probably a dozen mistakes in there. Mostly my absent minded grammar, but I did use correction sheets about three times. But I feel that the smoother and less problem free a typewriter is, the less I make mistakes. And I'll definitely start to add some photos of my environs in the near future. Fair comment. I don't ride a motorcycle, but much of what you say fits bicycles too. Well put. 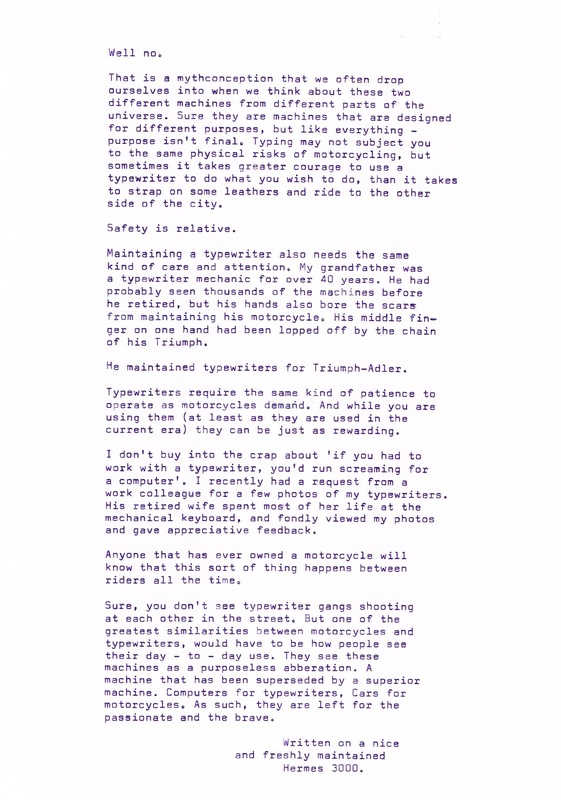 How interesting that your grandfather worked on Triumph motorcycles and Triumph typewriters. The companies were connected long ago. For sure Richard. I used to ride pushbikes everywhere, and I kinda feel that getting my drivers license at 25 has been a universal bad move. I don't think that my Grandfather had a particular affiliation to the Triumph motorcycles due to his work with Adler. But it is interesting that he chose those bikes particularly. I thing he was involved with Adler before they became joined with Triumph. But he's not around for me anymore to ask. Which is a shame. Well, I've thrown a few up on my latest blog for you to check out – if you so desire.